If you are searching for downtown Wichita apartments, Bokeh Development has plenty of apartment options located in the heart of downtown Wichita. If you have always wanted to enjoy city living with the energy and buzz that downtown brings, you can have it in one of Bokeh Development’s downtown apartments — The Renfro, The LUX, and Zelman Lofts. By living in one of our available downtown Wichita apartments, you can walk to grab a bite to eat or attend a concert. The possibilities are endless when you choose a Bokeh Development downtown apartment. We offer affordable downtown Wichita apartments, including one bedroom apartments, two bedroom apartments, lofts, studio apartments, furnished apartments, and essential units. 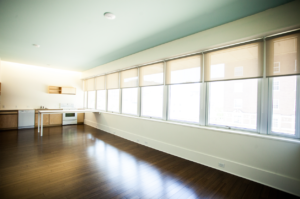 No matter what you’re looking for, we’re sure to have a downtown apartment option for you. We currently have a number of available downtown Wichita apartments, so be sure to check out our current residential spaces. For more information about living in downtown Wichita or to tour one of our downtown apartments, please contact us.